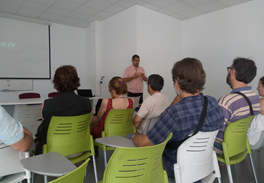 On Wednesday 21 June, IGCAT participated to a meeting organised by EcoRegió Catalunya and the Municipality of Celrà (Girona) at the Centre de Promoció econòmica in Celrà, to celebrate the approval of the MicroEcoRegion Ter Gavarres project. After attending the meeting of EcoRegió Catalunya Steering Committee in the morning, where possible opportunities for collaboration were explored, IGCAT was invited to the presentation of the MicroEcoRegion Ter Gavarres, held by Director of EcoRegió Catalunya and President of DynamisLab, Oriol Costa Lechuga. The event gathered producers and other stakeholders from the region, offering them a networking opportunity to collect idea on possible actions for the development of the initiative. The MicroEcoRegion Ter Gavarres project gathers ten municipalities in the Ter Gavarres area (Catalonia, Spain), led by the Municipality of Celrà with the support of the Provincial Government of Girona, and aims to link local agriculture and gastronomy, capitalising on the natural and cultural heritage of the region. Its main goal is to boost sustainable regional development by generating employment and synergies in the organic food sector of the area. By favouring the creation of innovative zero-Km products and the recovery of local agricultural land in disuse, the project proposes to develop a Ter-Gavarres brand. EcoRegió Catalunya supports the creation of micro-EcoRegions as economic communities “for organic food.” By means of micro-capital contribution, “farmers, local citizens, governments and universities promote the ecological enterprises of their own region” and, as shareholders, contribute to boost regional economy. According to EcoRegió Catalunya Implementation Guide (available in Spanish), the main goals of a micro-ecoregion are to enhance dissemination of organic food; contribute to regional economic revitalisation by generating employment; boost regional food sovereignty; develop added value chains connecting farms, manufacturers, shops and distributors; invest in health and social impact; and generate positive environmental, social and economic externalities. DynamisLab is the organisation in charge of the implementation of the EcoRegió initiative in Spain. It provides expertise to develop projects concerning local economy and organic agriculture, and fostering environmental, social and economic sustainability.